Monster Madness slots is a 3x3 and 8 payline video slot by Tom Horn. In this game, you travel to a futuristic city inhabited by all sorts of colourful monsters. Played on an unorthodox 3 reels and 3 rows - this beastly slot offers free spins with multiplier scatters and a gamble bonus. The graphics in this game are of the highest quality. Every bulge, tentacle and gruesome feature of the monsters is exquisitely detailed. In the background, advanced hovering vehicles whiz by, immersing you in the futuristic scene. But you will struggle to take it all in if you hit the max game win of 200x. The free spins are certainly not a monstrous sight. And you can activate them by hitting three of the scatter symbols. This will award 5 free spins. During the bonus, the normal scatter symbol will be removed from the reels. A new symbol will be added in place of the scatter symbol: the scatter wild symbol. Not only can this symbol add more spins to your bonus - but it will also multiply your wins. And the more symbols that land will correlate to the free spins and multiplier awarded. 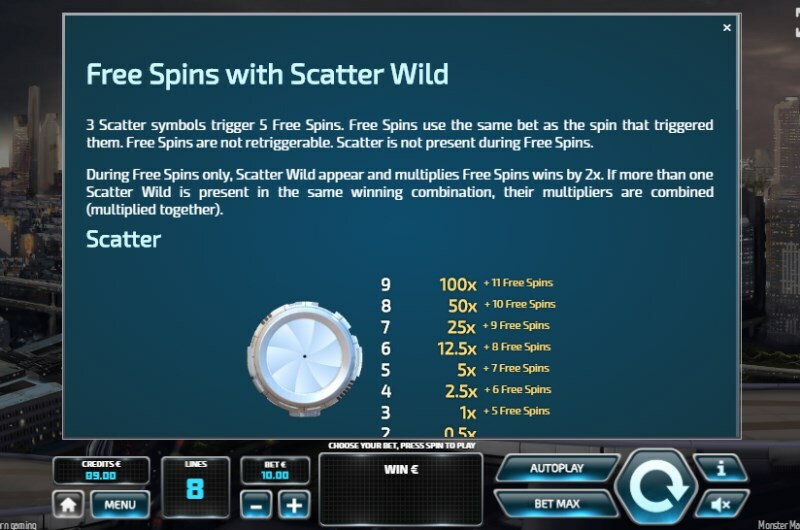 Landing 5 scatter wilds in the same winning combination, for example, will net you 7 extra free spins with a 5x multiplier on the win. The maximum reward is well worth shooting for: a 9 scatter wild match will give you 11 free spins and a 100x win multiplier. There is also a gamble bonus round that is available after every successful win. On a winning spin, you will be given the option to collect or gamble. If you choose to gamble, you will be shown a face-down card - and you will have to guess which colour the card is. Your options are either red or black, giving you a 50/50 chance. Answering correctly will double your current win - and you can choose to collect after a successful guess. An incorrect guess will forfeit all winnings - even the winnings that activated the feature. If you choose to collect your current winnings after a winning spin, you will take whatever you win and not enter the gamble bonus. The Monster Madness slots has a return to player of 96% - which is the average RTP you can expect from a video slot. This is also a medium volatility game - meaning that wins are frequent, but big wins are a rare occurrence. This medium variance means the Tom Horn slot is good for a range of player levels - including beginners. The highest paying symbol in the game is the orange fanged monster - which awards 12x your staked bet for a three of a kind match. With prizes of 200x total stake bet available during the free spins and base game - this slot has some monster winning potential. 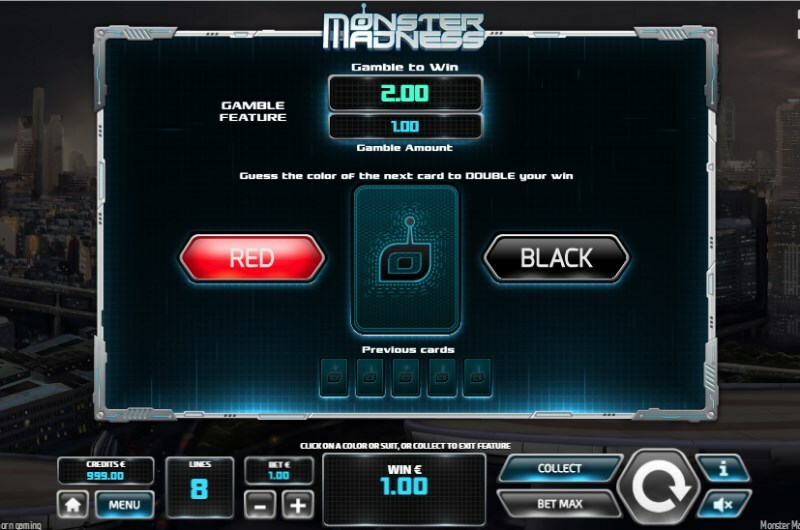 A refreshing change from 20 payline or 243 ways to win slots - Monster Madness is a call back to classic slots machines. But thanks to some 21st features including free spins and the scatter multiplier - this beast is sporting a fresh coat of paint. It's a fun, exciting and feature-packed slot that you can play right now at Pots of Gold.